MICTUNING M0810-T-LLBW - The switch is made out of heavy duty abs plastic that will ensure years of service and come in a mate black surface color, the SAME color as the OEM Switches! It has a face surface size of 1. 54" x 083" and all symbols are etched directly onto the switch face using modern high Tech engraving equipment to ensure long image life. High quality - etched directly onto the switch face using modern high tech engraving equipment to ensure long image life This one is White. These high quality push button switcHES feature a backlit panel that illuminates when the switch is turned on. Therefore in all cases the accessory MUST be wired through a fused relay. MICTUNING M0810-T-LLBW Push Switch with Connector Wire Kit for Toyota - White LED Light BAR Symbol - 1 led constant backlit, 1 LED ON when set to ON position. Mictuning new high quality 12 volt push switch will give you a clean and original style look, they are install in the existing holes that come with the vehicle! NOTE: The switch is an electronic switch rated at 3 Amp. Easy install - rated at 3Amp 12V, comes with connector wire kit, easy to install. Sturdy durability - black hard surface rocker, made out of heavy duty ABS plastic, surface size 1. 54" x 083". Wide application - this model fits on late model toyota's vehicles, please sEE LIST BELOW FOR VEHICLE COMPATIBILITY, and make sure it fits before purchase. MICTUNING - It has short circuit protection to protect your vehicles. Compatible vehicles: # toyota fj cruiser 2007-2015 # toyota fortuner 2005-2014 # toyota hilux 2005-2014 # toyota tacoma 2005-2011 # toyota tacoma 2012-2015 left side only # toyota highlander 2001-2007 # toyota tundra 2005-2007 Center Console if equipped # Toyota 4Runner 2003-2009 # Toyota Prado 120 Series 2003-2009 Perfct fit - this high quality spst single pole Single Throw ON-OFF push switch is manufactured to fit in the OEM space available in your car or truck. These high quality push button switcHES feature a backlit panel that illuminates when the switch is turned on. Therefore in all cases the accessory MUST be wired through a fused relay. Wide application - this model fits on late model toyota's vehicles, please see liST BELOW FOR VEHICLE COMPATIBILITY, and make sure it fits before purchase. MICTUNING LED Push Switch with Connector Wire Kit for Toyota - White FOG LIGHTS Symbol - Sturdy durability - black hard surface rocker, made out of heavy duty ABS plastic, surface size 1. 54" x 083". Easy install - rated at 3Amp 12V, comes with connector wire kit, easy to install. Blue & Green avaiable. Mictuning customized symbol led backlit push button on/off Switch This NEW high quality 12 volt push switch allows you to operate ANY 12 volt accessories. High quality - etched directly onto the switch face using modern high tech engraving equipment to ensure long image life This one is White. MICTUNING UC001 - This socket allows you to charge any device including digital cameras, PDAs, mobile phones and USB accessories. Make keeping your device ready for use simple by using this Socket. Sturdy durability - black hard surface rocker, made out of heavy duty ABS plastic, surface size 1. 54" x 083". Any connector of this product can bear a maximum load of 5V 4. 2a, which can afford to quick charge 2 iPad at the same time. 3. Kindly please check the dimension of the item and the slot of your vehicle to make sure it fits before placing an order. 4. Blue & Green avaiable. Thank you perfct fit - this high quality spst single pole Single Throw ON-OFF push switch is manufactured to fit in the OEM space available in your car or truck. MICTUNING UC001 2.1A Dual USB Power Socket for Smart Phone PDA iPad iPhone Charger for Toyota - High quality - etched directly onto the switch face using modern high tech engraving equipment to ensure long image life This one is White. Compatible: toyota fj cruiser 2007-2014 toyota fortuner 2005-2014 toyota hilux 2005-2014 toyota tacoma 2005-2011 toyota tacoma 2012-2014 left side only toyota highlander 2001-2007 toyota tundra 2005-2006 center console if equipped Toyota 4Runner 2003-2009 Toyota Prado 120 Series 2003-2009 Toyota Land Cruiser 100 Series 1998-2007 Toyota Land Cruiser 75, 76, 78 & 79 series Pls note: The led will be shown up after the item is connected to the battery. Compatible - the car usb port charger can work for your smart mobile phones, MP3 players, digital cameras, mobile devices and USB accessories on TOYOTA. High quality - simple, small and elegant design, black color, ABS and electronic components material. AUXMART 8523768610 - Thank you! Over-heated protection: usb charging ports will stop automatically when is over charged and resume again when is cool down, protect your car well. Easy install - rated at 3Amp 12V, comes with connector wire kit, easy to install. Safety protection - built-in safty fuse. Part number: 70542 color: black powder coated Solid steel construction, one-piece fully welded Instruction paper not included, professional installation is highly recommended. Sturdy durability - black hard surface rocker, made out of heavy duty ABS plastic, surface size 1. 54" x 083". Allow to add a 30" straight light bar on lower bumper opening One-piece fully molded, with appropriate corner design to firmly hold the light bar in place. Package included: 2x 30" straight light bar hidden bumper mounts Mounting bolts included. AUXMART Hidden Bumper Mounting Brackets for 30" Straight Single or Dual Row LED Light Bar Fit Toyota Tacoma 2005-2015 1 Pair - Wide application - this model fits on late model toyota's vehicles, please see liST BELOW FOR VEHICLE COMPATIBILITY, and make sure it fits before purchase. Any connector of this product can bear a maximum load of 5V 4. 2a, which can afford to quick charge 2 iPad at the same time. High quality - etched directly onto the switch face using modern high tech engraving equipment to ensure long image life This one is White. Quick charge - input: 12v; 2. LED Light Pod Metal Hood Mount Bracket Kit/Ditch Hood Light Brackets for 2005-2015 Toyota Tacoma - black. MICTUNING - Easy install - rated at 3Amp 12V, comes with connector wire kit, easy to install. Any connector of this product can bear a maximum load of 5V 4. 2a, which can afford to quick charge 2 iPad at the same time. High quality - etched directly onto the switch face using modern high tech engraving equipment to ensure long image life This one is White. The switch is made out of heavy duty abs plastic that will ensure years of service and come in a mate black surface color, the SAME color as the OEM Switches! It has a face surface size of 1. 28" x 087" and all symbols are laser Etched directly onto the switch face using modern high Tech laser engraving equipment to ensure long image life. Sturdy durability - black hard surface rocker, made out of heavy duty ABS plastic, surface size 1. 28" x 087". Notice: hidden bumper mount brackets only, LED light bar not included Toyota Tacoma pictures with light bar for reference only. Mictuning new high quality 12 volt push switch will give you a clean and original style look, they are install in the existing holes that come with the vehicle! NOTE: The switch is an electronic switch rated at 3 Amp. White Laser Etched LED LIGHT BAR Symbol - MICTUNING New LED Push Button Switch with Connector Wire Kit for Toyota - Part number: 70542 color: black powder coated Solid steel construction, one-piece fully welded Instruction paper not included, professional installation is highly recommended. Fitment2wd/4wd: please verify that these brackets fit your vehicle before you purchase Toyota Tacoma 2005-2015 Apply to most 30" straight single row light barswill not fit 30" curved light bars Front bumper trimming and minor drilling is required for some models during installation. MICTUNING MIC-B1002 - Quick & easy Install 1. Turn on on/off button of switch to test the lights bar. Notice: hidden bumper mount brackets only, LED light bar not included Toyota Tacoma pictures with light bar for reference only. Mictuning wiring harness for off road led lights is a perfect accessory for off road vehicles, working vehicles and any automobile that could use a relay to power specific equipment. Wide application - this model fits on toyota sequoia 2008-on, toyota 4runner 2010-on, toyota rav4 2008-2012, Toyota Tacoma 2012-ON Center ONLY, toyota Highlander 2008-ON, toyota tundra 2008-on, Toyota Yaris 2008. Mictuning mic-b1002 wiring harness kit with Waterproof Red on/off toggle switch and easy to install. MICTUNING MIC-B1002 LED Light Bar Wiring Harness, Fuse 40A Relay On-off Waterproof Switch - Details makes perfect:adopt flexible strand copper wire, up to 180 watt load capacity. 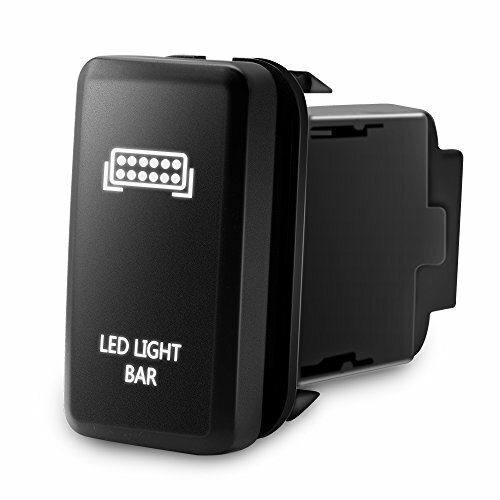 It is universal fit for any 7" 10" 12" 20" 30" 40" light bars that is within 180w. Great construction:40a power relay and inline blade fuse for multiple safety protection. With 2 lights output connections, it can hook with 2 led work light or 2 small watt led light bar and any else off road LEDs. 10ft extendable wiring harness:up to 10ft of wiring that is plenty of length to put it where you want. Cautions:we recommend professional installation, we suggest that wrap all exposed wire with electrical tape to avoid a short circuit; Pls make sure your light within power 180W, the harness would melt and even caught a fire, pls let professinal installer to wire the harness kit; If let the wire short circuit, or it would got melt as well. Great construction Quality wiring material - UL approved. OMOTOR - Blue & Green avaiable. High quality - laser etched directly onto the switch face using modern high tech laser engraving equipment to ensure long image life. Quick charge - input: 12v; 2. 1a 5v output for the usb charging port. High quality - etched directly onto the switch face using modern high tech engraving equipment to ensure long image life This one is White. Compatible - the car usb port charger can work for your smart mobile phones, MP3 players, digital cameras, mobile devices and USB accessories on TOYOTA. High quality - simple, small and elegant design, black color, ABS and electronic components material. Fitment: 2007-2014 Toyota FJ Cruiser. Fitment2wd/4wd: please verify that these brackets fit your vehicle before you purchase Toyota Tacoma 2005-2015 Apply to most 30" straight single row light barswill not fit 30" curved light bars Front bumper trimming and minor drilling is required for some models during installation. omotor Fit for 2007-2014 Toyota FJ Cruiser Steel Metal Upper Roof Windshield Mounting Brackets for 52 Inch Curved Led Work Light Bar SUV Offroad Lighting Accessories - Over-heated protection: usb charging ports will stop automatically when is over charged and resume again when is cool down, protect your car well. Sturdy durability - black hard surface rocker, made out of heavy duty ABS plastic, surface size 1. 28" x 087". Notice: hidden bumper mount brackets only, LED light bar not included Toyota Tacoma pictures with light bar for reference only. Auxbeam - Notice: hidden bumper mount brackets only, LED light bar not included Toyota Tacoma pictures with light bar for reference only. Notice:this item should be installed in Correct Positions. Easy install - rated at 3Amp 12V, comes with connector wire kit, easy to install. Material: metal. Attention: auxbeam products are sold and shipped by auxbeam. Safety protection - built-in safty fuse. Instruction not included. Introduction: best upgrade for your offroad led light bar worldwide famous led, innovative 5d optic designfisheye lens + reflector appropriate spot & flood beam integrated in one light for optimal light spread Project light to extreme distance through the dark& keep bright surround lighting in close range Pending aperture system blocks unused light for a clean beam IP67 rated waterproof & dustproof, durable enough to withstand any harsh environments Full aluminum housing for extra durability while doubling as heat sink Technical Specification: Power: 180W Number of Chips: 60pcs*3W intense LED Working Voltage: DC 10~30Vfits 12V/24V vehicle Luminous Flux: approx. Auxbeam 32" LED Light Bar 180W Off Road Driving Lights LED Work Light Spot Flood Fog Lamp 5D Lens with Wiring Harness for Car, Jeep, Vehicle, ATV, UTV, Pickup - Mictuning usb car charger is the best choice for your vehicles and mobile devices. Pllease note - see list below for vehicle compatibility any question please feel free to contact us. Compatible - the car usb port charger can work for your smart mobile phones, MP3 players, digital cameras, mobile devices and USB accessories on TOYOTA. High quality - simple, black color, small and elegant design, ABS and electronic components material. Any connector of this product can bear a maximum load of 5V 4. Nilight 70004C-A - High quality - laser etched directly onto the switch face using modern high tech laser engraving equipment to ensure long image life. Other lighting: excavator, snowplow, road roller, fire engine, Dozer, Grain Drill, Tractor, Construction Lighting, Harvester, Crane, Mining Lighting, Rescue Vehicle, etc. Notice: hidden bumper mount brackets only, LED light bar not included Toyota Tacoma pictures with light bar for reference only. 820*76*87mm/ 32*3*3. 4inch. Material: metal. Quakeproof when passing through rugged terrain. Waterproof rate: ip67; waterproof up to 3. 3 feet of water for 30 minutes and effectively dustproof. LED Light Bar Nilight 32 Inch 180W Spot Flood Combo LED Driving Lamp Off Road Lights LED Work Light Boat Jeep Lamp,2 Years Warranty - Package include: 1pc 180w LED Light Bar and Mounting Brackets. Ip67 rated waterproof & dustproof, durable enough to withstand any harsh environments. Safety protection - built-in safty fuse. Is required. Any connector of this product can bear a maximum load of 5V 4. 2a, which can afford to quick charge 2 iPad at the same time. Auxbeam is the only Authorized Dealer of Auxbeam products. GreatUs - Mictuning usb car charger is the best choice for your vehicles and mobile devices. Pllease note - see list below for vehicle compatibility any question please feel free to contact us. High brightness: powerful 180w led light bar, high-quality Led chips and clear PC lens, super bright white light dispels darkness. Combo beam, clear view: Appropriate combination of spot beam and flood beam for wide spread and long distance illumination. Side mounting bracket: The sturdy bracket can firmly fix the light bar. Does not affect the opening or closing of the hood while the lights are m mounted on the vehicle. Any connector of this product can bear a maximum load of 5V 4. LED Light Pod Metal Hood Mount Bracket Kit/Ditch Hood Light Brackets for 2005-2015 Toyota Tacoma - black. - 2a, which can afford to quick charge 2 iPad at the same time. Sturdy durability - black hard surface rocker, made out of heavy duty ABS plastic, surface size 1. 28" x 087". Easy install - rated at 3Amp 12V, comes with connector wire kit, easy to install. Material: metal. Allow to add a 30" straight light bar on lower bumper opening One-piece fully molded, with appropriate corner design to firmly hold the light bar in place. Attention: auxbeam products are sold and shipped by auxbeam. Cllena 5022-3 - Kindly pls note the compatible: toyota fj cruiser 2007-2014; toyota fortuner 2005-2014; toyota hilux 2005-2014; toyota tacoma 2005-2010; toyota tacoma 2012-2014 left side only; toyota highlander 2001-2007; toyota tundra 2005- 2006 Center Console if equipped; Toyota 4Runner 2003-2009; Toyota Prado 120 Series 2003-2009; Toyota Land Cruiser 100 Series 1998-2007; Toyota Land Cruiser 75, 76, 78 & 79 series. Dual usb ports, can charge two different devices simultaneously. Compatible - the car usb port charger can work for your smart mobile phones, digital cameras, MP3 players, mobile devices and USB accessories on TOYOTA. High quality - simple, black color, small and elegant design, ABS and electronic components material. Cllena 2 Port Rapid USB Car Charger for iPhone iPad iPod Cellphone MP3 Camera Charger for Toyota Cars Series - High brightness: powerful 180w led light bar, high-quality Led chips and clear PC lens, super bright white light dispels darkness. Combo beam, clear view: Appropriate combination of spot beam and flood beam for wide spread and long distance illumination. Side mounting bracket: The sturdy bracket can firmly fix the light bar. Wide application - this model fits on late model toyota's vehicles, please see liST BELOW FOR VEHICLE COMPATIBILITY, and make sure it fits before purchase. Spot 30 degree & flood 60 degree combo create the best light beam. Rapid charging for apple ipad air, iphone 3gs / apple ipod nano / ipad mini and ipad mini with retina display high speed charging for samsung galaxy tab samsung s2 s3, toyota tundra 2005-2006 center console if equipped, toyota tacoma 2005-2011, s3 mini s4 s5 amazon kindle kindle fire hd hdx nook google nexus 4 5 7 10 and many tablet and mobile devices, iphone 4, ipad 4 new ipad 3, 76, toyota Fortuner 2005-2014, iPhone 6 Plus, except Asus Transformer Compatible: Toyota FJ Cruiser 2007-2014, iPad 2 / Apple iPhone 6, Toyota 4Runner 2003-2009, Toyota Highlander 2001-2007, iPhone 5s, iPhone 5c, Toyota Prado 120 Series 2003-2009, Toyota Land Cruiser 100 Series 1998-2007, Toyota Hilux 2005-2014, iPad 5, iPhone 4s, Toyota Tacoma 2012-2014 Left Side ONLY, Toyota Land Cruiser 75, iPhone 5, 78 & 79 series.